In this day’s lesson, the author refers to 1 Thessalonians 4:13-18 again, and asks the reader to list clues in the passage that point to the false beliefs which produced unnecessary grief to those who held them. The author goes on to teach that the false belief Paul was addressing in this passage was probably that those who died before Jesus came would not go to heaven, and therefore, the people who died before Christ’s 2nd coming would share in the “world to come”, but not go to heaven. In this passage, Paul directly addresses death and life. To understand what Paul is teaching in 1 Thessalonians 4:13-18, one must have an understanding of what the New Testament teaches about the new birth. First, in John 3, Nicodemus came to Jesus to discuss the miraculous signs that He’d been performing. Jesus told him that in order to see the Kingdom of God, one must be born again. Jesus went on to explain: in order to be born again, one must be born first of the flesh, and then of the Spirit. In other words, just as our bodies are born from our mother’s womb, so our spirit is born from the Holy Spirit. The Bible often teaches that we have many “parts”. For example, it addresses our body, soul, spirit, mind and heart. In Hebrews 4, we learn that the Word of God is like a sword which can discern even the difference between soul and spirit. 4 “But God loves us deeply. He is full of mercy. 5 So he gave us new life because of what Christ has done. He gave us life even when we were dead in sin. God's grace has saved you. Notice that through God’s mercy, the “work” of getting to heaven is finished. The verb tenses are important. God raised and seated us (past tense) and He has done it (past tense) to show off His grace toward us. We are not physically seated beside Christ. So, how are we seated in the heavenly places? In Christ, through the new spirit that has been born by the Holy Spirit as a result of God’s grace. Once the new birth is understood, the simplest reading of 1 Thessalonians 4:13-18 makes sense. That is: the person who has received a new, living spirit through Christ will never be separated from Him. Indeed, Paul says, they will even return with Him! The hope we have as believers is alive and anchored in the person of Christ. Biblically speaking, hope is not wishful thinking, but rather confident assurance in who He is and what He has accomplished on our behalf. The news is very, very good! 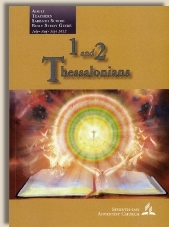 Understanding the new birth makes a simple reading of 1 Thessalonians 4 possible. The simple good news is this: those who are in Christ will never be separated from Him.